Swanage RNLI Fundraising marathon begins! As the volunteer lifeboat crew gathered for their recent crew meeting it soon became clear that the next couple of years are going to be busy, with lots of changes afoot on all fronts. Not only are we embarking on our biggest fundraising challenge in many years, as we aim to raise money towards our brand new lifeboat station, but amongst this five of the crew are getting married this year! So in between the rescues and weddings, we have some ambitious plans to come up with many new and challenging fundraising ideas to help reach our target. 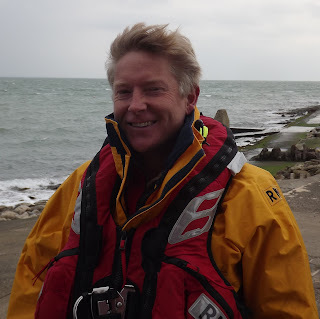 Our first crew member to jump to the challenge is volunteer lifeboat crewman Neil Brooks who will be running the Virgin London Marathon with his wife Tracy in aid of the Swanage Lifeboat Station Appeal. Having previously run the London Marathon for the RNLI in 2009 Neil felt that having recently joined the Swanage lifeboat crew it seem like a good time to do it again! Neil has already nearly raised £100 sponsorship for each mile of the route and is hoping to generate £3000 for his efforts. If you can help him along the way please visit is sponsorship page www.virginmoneygiving.com/neilbrooks or drop in your sponsorship to the Swanage Lifeboat shop, or Swanage Lifeboat Station. With Neil already setting the bar so high his fellow crew members and the community volunteers will be working hard to maintain this high standard throughout the appeal. Good luck to Neil and Tracy!